Nextek VC-3 - Solacity Inc. The Vari-Cyclone DC Powered Ceiling Fan is the perfect choice for off-grid systems where an energy efficient ventilation solution is needed. By running directly on 12 or 24 Volt DC from the batteries, an inverter is not needed. The Vari-Cyclone can be used in a variety of indoor/outdoor applications including porches, gazebos, pergolas, greenhouses, warehouses and cabins. The Vari-Cyclone’s 60″ diameter blades, designed by the Florida Solar Energy Center in cooperation with a major fan manufacturer utilize “Gossamer Wind Technology” found only in AC powered fans until now. 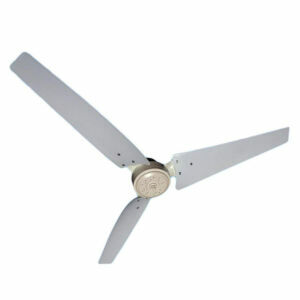 Nextek Power Systems is the only DC fan company allowed to use these revolutionary new fan blades. The “Gossamer Wind Technology” blades allow the fan to produce up to 40% more air flow with no increase in power consumption, making the Vari-Cyclone the most energy efficient DC powered ceiling fan available. The Vari-Cyclone is powered by a permanent magnet, TENV (totally enclosed non-ventilated) motor with long life brushes. The Vari-Cyclone draws 0.5 Amp @ 12 Volt DC and 0.78 Amp at 24 Volt DC. At 12 Volt DC the 3-blade fan will have approximately 102 rpm moving 1,400 CFM when mounted at least 8 feet above the floor in an open room. At 24 Volt DC the 3-blade fan will have approximately 138 rpm moving 3,900 CFM when mounted at least 8 feet above the floor in an open room.